As with any cancer, treatment for Mesothelioma depends on the location of the cancer, the progression of the disease, the age as well as state of health of the patient. 1. If the diagnosis is done in the early stages surgery may be recommended to remove all cancerous tissues. This means thoracoscopy, VATS or video assisted thoracic surgery, mediastinoscopy (used for staging), or laproscopy. Often, doctors will advise palliative procedures like chest tube drainage and pleurodesis, thoracoscopy and pleurodesis, pleuroperitonial shunt, or pleurectomy, which treat the symptoms of mesothelioma rather than the disease. 2. Radiation is prescribed aggressively for mesothelioma patients and is often given in combination with surgery or in order to control symptoms, palliatively. Research on using radiation therapy using implants or UV light therapy is in progress as traditional radiation therapy damages surrounding healthy tissue. 3. Chemotherapy is an option and around 12-20% of patients respond to the drugs. Anti-cancer drugs destroy cancer cells and prevent their spread. 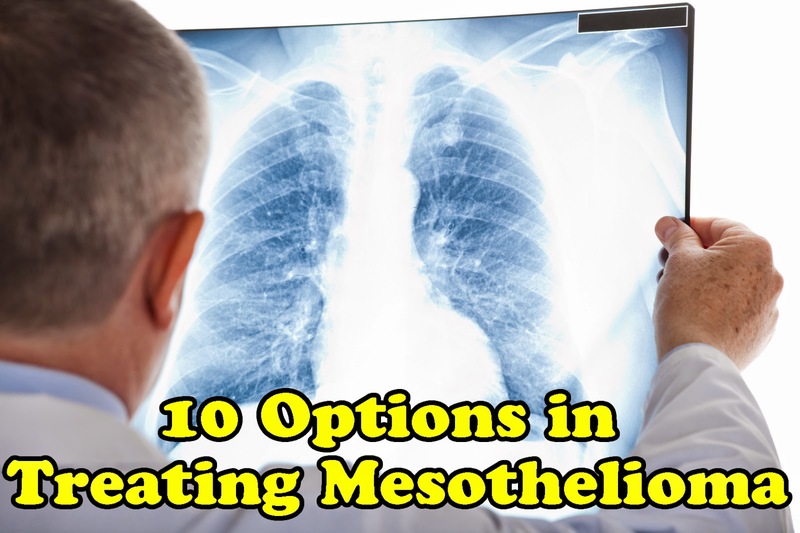 In mesothelioma, chemotherapy is not considered to be curative. The aim is to prevent spread of the disease; shrink the tumor prior to surgery, known as neoadjuvant therapy; to annihilate any remains of the tumor in the body post surgery; and to relieve pain and other discomfort, palliative chemotherapy. Experts recommend prescribing premetrexed along with cisplastin. These drugs have shown positive results and this is now standard care for Mesothelioma not treatable by surgery. 5. Immunotherapy where the body’s own immune system is stimulated to fight the disease. Biological response modifiers, BRMs, are used in treatment. These enhance the functions of the immune system; regulate metabolic reactions that promote growth of cancers; alter cancer cell division; block or reverse processes that lead to formation of cancers; and prevent spread of cancer. 6. Gene therapy, where attempts are made to correct the gene sequence that causes the cancer. This is of two kinds, replacement gene therapy and knockout gene therapy. 8. Photodynamic treatment where a photosensitive medication is activated using a laser. This is done during the surgical removal of cancerous tissues. 9. Draining of fluid in the chest or abdominal cavity followed by introduction of medications into the cavity to prevent fluid accumulation is done for patients who have uncontrolled fluid accumulation and intense discomfort stemming from it. 10. Combination therapy or Trimodal therapy which means surgery accompanied by radiation and chemotherapy. Often, complementary medicines are also used. Termed to be holistic this kind of treatment focuses on a patient’s physical, mental, emotional, and spiritual well being.